Kingseeker Frampt is a friend to the Great Lord Gwyn. Since Gwyn became the fuel for the First Flame, Frampt, as Kingseeker, is currently looking for a new Great Lord to prolong the Age of Fire. He tasks the chosen Undead to travel to Anor Londo to acquire the Lordvessel, then collect powerful Souls to satiate the Lordvessel so that the chosen Undead can take Lord Gwyn's place. Appears after ringing both Bells of Awakening. He'll appear from the hole at the pool area, now drained of water, near the "quest item" treasure chest. The only way you can "sell" your items for souls. You cannot "buy" back items "sold" to Frampt. Use the "Feed Item" option on his dialogue options. Warps you to Firelink Altar and vice-versa. Use the "Warp" option on his dialogue options. 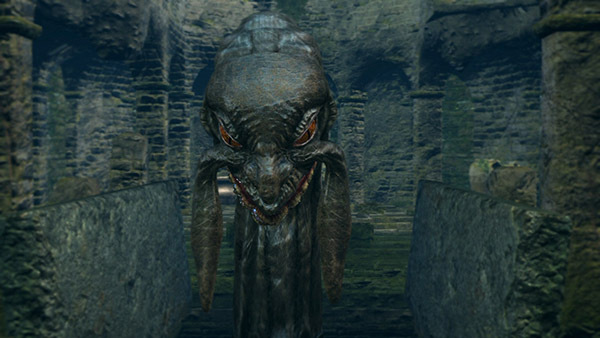 After you ring the first Bell of Awakening, you can hear his snores (with subtitles) when you walk in the pool area in Firelink Shrine. If you drop into the hole while he's asleep and place the Lordvessel then warp back out and speak with him again, he'll state that you are not the chosen and leave. You can still hop down to deliver the Souls though. Any time you visit him after changing area, you may find him sleeping. Attack him once to wake him up. More than one hit will make him become hostile and he will leave your current game cycle. Feeding items to Frampt can show some backstory in itself, primarily by looking at the soul value of various items. He seems to like Dragon equipment, anything related to Lord Gwyn, anything worn by females, and he seems to be friends with Havel the Rock. He'll give you 5,000 souls for all dragon weapons (except Moonlight Greatsword); 1,000 souls for female clothing (including Goddess Fina's Set of Favor); and higher souls than usual for Havel's Greatshield (1,000 souls, much more than the 50/100 typical of most shields) and Havel's Ring (1,000 souls, tenfold what other typical rings trade for). Conversely, he hates Smough and Seath. Soul of Smough, Smough's Set, Moonlight Greatsword, Channeler equipment, and all Crystal weapons trade for only 1 soul. You can sell him all normal soul shards for 500; therefore, feeding Frampt Soul of a Lost Undead and Large Soul of a Lost Undead (worth 200 and 400 souls respectively) is more beneficial than consuming them directly. There appears to be a glitch in NG+ playthroughs where you will not get the option to break down upgrade materials carried over from previous playthroughs. This can be fixed by removing all of these materials from your inventory (either by depositing them in the bottomless box, or by dropping them), then reacquiring them. Ahh, hello. Was it you who rang the Bell of Awakening? 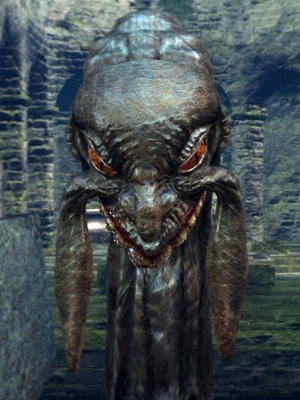 I am the Primordial Serpent, Kingseeker Frampt, close friend of the Great Lord Gwyn. Chosen Undead, who has rung the Bell of Awakening. I wish to elucidate your fate. Do you seek such enlightenment? Very well. Then I am pleased to share. Chosen Undead. Your fate is… to succeed the Great Lord Gwyn. So that you may link the Fire, cast away the Dark, and undo the curse of the Undead. To this end, you must visit Anor Londo, and acquire the Lordvessel. By the Lords… Are you certain? Well, perhaps I was wrong. There can be only one chosen undead. I will continue my search… You are freed from duty. But then again, you did ring the Bell of Awakening. I will stay here a while. Speak with me if you should change your mind. I am pleased to see you well. Those who seek the Realm of the Lords must brave Sen's Fortress, a deadly house of traps. Many have gone before you, but none have returned. Fate has chosen you, but proceed with caution. Chosen Undead. I remain here, and await thee. … Hm? No, no, I'm fine, I'm fine. Do not treat me like an old withering snake. Heavens! You have done it! You have retrieved the Lordvessel! After a thousand years! It is you, it is really you! Forgive me. I really should calm down. Now, let us take that vessel on a journey. I assume that you are ready. Now, be still! This is the Firelink Chamber, for the successor of Lord Gwyn. Now, place the Lordvessel on the altar. What is it? Place the Lordvessel on the altar. No reason for pause at this point. As Kingseeker, I shall now instruct you, the Lord's successor in your next task. commensurate to the great soul of Gwyn. Scarce few possess such brilliant souls. and Lord Gwyn's former confidant, Seath the Scaleless. All of their souls are required to satiate the lordvessel. Then we shall return. Stay still for a moment! The beings who possess these souls have outlived their usefulness, or have chosen the path of the wicked. As the primordial serpent, I implore you to defeat them, and claim their souls. Let there be no guilt; let there be no vacillation. Magnificent… You are the righteous successor to Gwyn, the new Great Lord. Your acquaintance was an honour. I must admit, I am fond of you humans. And may the Age of Fire perpetuate. You sorry fool… You could not be the Chosen one.